Are you dreaming of the white sands and idyllic waters of Bali for your next holiday? If your flight gets in late or you're planning on flying home in the early hours of the morning, you'll probably want to stay somewhere near the airport. The good news is that all of our Tuban hotels are less than five minutes from the Ngurah Rai International Airport (also known as the Denpasar Bali International Airport), so there's no need to sweat about the logistics on your relaxing break in balmy Bali. Located in the centre of the Kuta district, the southern tip of Bali is within easy reach so make sure you check out the famous South Kuta Beach while you're here. Tuban and the airport area is just a thin strip of island, joining South Kuta to the main part of the island of Bali and when you stay here, you'll be treated to beautiful views of the Bali Sea on both the east and west sides. These beaches are perfect for swimming, fishing and working on your tan. If you're looking for good surf, just hit up the waves on Kuta Beach, which is about five kilometres north of Tuban. Perhaps the best thing about Tuban's location is the fact that it's only 10km from Bali’s capital, Denpasar, where you can truly immerse yourself in Balinese culture. Be sure to visit the Bali Museum, Sanur Beach and the Pur Jagatnatha Temple while you're in the city. No matter where you go in Bali, you'll always find heaps of small markets and street vendors selling souvenirs. But serious shoppers should head to Badung Market in Denpasar. This is Bali's largest and oldest market, and it's the perfect place to pick up traditional textiles, handicrafts and fresh produce. After a big day in the sun, you can settle your growling stomach at a waterfront restaurant or chow down on some yummy street food. Central Kuta is well known for its vibrant nightlife, so when the sun goes down, shake off your jet lag and go live it up in the nightclubs or party on the beach like there's no tomorrow! To get to Tuban, all you need to do is book one of these cheap flights to Bali and then you can get around by minibus or hire a scooter. And if you're keen to go island-hopping, the ferry services at Benoa Harbour aren't far away. A convenient location, right near Bali's airport and capital city with beautiful beach views too – wot more could you ask for? Book your flights and Tuban accommodation with us now. How Much is a Hotel Room in Tuban? 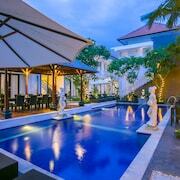 Hotels in Tuban start at AU$24 per night. Prices and availability subject to change. Additional terms may apply.